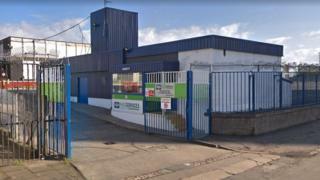 Owners of Gemini Rail Services in Springburn, the former Knorr-Bremse Rail Services depot, announced closure plans on Wednesday. The 120 staff members and 60 contractors were told a formal consultation would begin on the proposed closure. The move is being blamed on falling orders, but Unite believes there is enough work to sustain the site until next year. The Springburn depot carries out service, maintenance, repair, overhaul and upgrades on trains for ScotRail. There are two other overhaul plants in Scotland, both in Kilmarnock, which also maintain ScotRail rolling stock. Gemini Rail Services UK Ltd said there had been an "unsustainable decline" in demand for maintenance work due to the introduction of new rolling stock. Unite said it had broached the issue several times with the company and the Scottish government, and is calling on ministers to intervene to ensure the site remains open. Pat McIlvogue, regional industrial officer, said: "Unite has been working hard to get clarity and seek assurances on the Springburn depot. "The proposed closure will affect around two hundred highly skilled jobs and lead to the ludicrous situation whereby the maintenance of Scotland's rail stock would be carried out in England. "This situation is completely unacceptable, which is why Unite has been raising this issue with the Scottish government over a number of months now." He added: "The announcement must concentrate the mind of the transport minister and the Scottish government must urgently intervene to ensure the future of the site." One worker told the BBC: "This is the worst news possible so close to Christmas." Image caption The Springburn facility maintains trains for ScotRail. The Scottish government said it was disappointed at learning about the timing of the consultation via the media, especially since officials met Gemini Rail Services as recently as last week. A spokesperson added: "We are committed to supporting rail services and have made record investment in the sector in recent years, including new rolling stock and towards improved infrastructure. "Although the award of contracts for heavy maintenance of rolling stock is a commercial matter for the leasing companies, we and our partners will do everything in our power to prevent this closure, including working with unions, the workforce and the company involved to explore all options." The SNP MSP for Springburn and Maryhill, Bob Doris, said he shared the trade union's anger at the decision. He said: "Employing up to 200 workers, it has a skilled workforce and an active order book that could now be heading out of the country. "It's also potentially of strategic importance to the Scottish economy and our railways. We must do all we can to save these jobs and this site and I will be raising this matter urgently at First Ministers Questions. "Springburn was once the proud heart of the world locomotive industry and its committed workforce deserve to see a vibrant future retained at the site, not redundancy." A spokesman for the company said: "It is with deep regret that Gemini Rail Services has had to announce to employees its proposal to close the Springburn site in Glasgow. "We are now entering a consultation period where all options will be explored with a view to avoiding redundancies. "The proposal is as a result of increasingly changing and challenging market conditions which are outside of our control. "It is very clear, as it has been for some time, that numbers of pre-privatisation rolling stock which have been the cornerstone of business for many years, are in severe decline. " He added; "Due to the introduction of more modern vehicles, the number of pre-privatisation vehicles in service will reduce by 80% in the next five years. "We recognise the dedication and hard work of all staff at Springburn and know this will be an upsetting period for them and their families. "Our priority now is to provide them with the most effective support with both collective and individual consultations. We will provide all assistance possible to help staff understand the options available to them and keep them fully informed of the consultation process."